How much does it cost to travel to Ao Nang? How much money will you need in Ao Nang? ฿3,126 ($98) is the average daily price for traveling in Ao Nang. The average price of food for one day is ฿714 ($22). The average price of a hotel for a couple is ฿3,029 ($95). Additional pricing is in the table below. These average travel prices have been collected from other travelers to help you plan your own travel budget. How expensive is Ao Nang? All you want is a nice, relaxing beach to curl up on for the vacation you've been looking forward to all year. It might be time to make a trip to Ao Nang, Thailand. This ultra "westernized" beach was once the place to be for backpackers, but is now quite popular with the package tourist crowds. Knowing where to go and what to see is relatively simple in Ao Nang given that almost everything is located either along the west to east shoreline, or along the north to south Airport road. Keep in mind, if you visit during the peak tourist seasons, you'll be met with beaches full of lots of boat engine noise. Try to find less popular times to visit. Also, be sure to ask the locals lots of questions. They're very willing to help visitors find the best spots of their home. 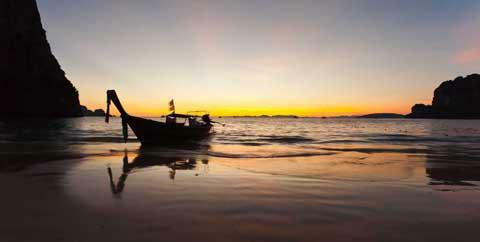 The biggest draw to Ao Nang, is their sandy beaches. The best views will all be along a shoreline, so grab some flip-flops and start exploring. Fossil Shell Beach, for example, is also known as the "Seashell Graveyard." This area is a bit of a tourist-trap, but it's worth it to see the compressed, 40 million year old shellfish. Bring your wallet, as the entrance fee can be pretty hefty. Nopparat Thara Beach is more picturesque. At the western tip of Ao Nang, this beach is designated as a national park. Before venturing into the water, ask the locals of it's "jellyfish season." That's not a risk you want to take, trust me. For a more isolated afternoon, head over to Rai Leh Beach. This beach is a bit of a trek, as you have to travel there via long-tail boat. The limestone hills separate it from the mainland. In the off-season it may be a hassle to get there, as many of the boats for crossing wait for the required number of passengers to take off. IT can be worth the wait and the fees, though, because Rai Leh is a bit cleaner with lots of caves for exploring. If lying on a beach is just not enough of a vacation for you, peel yourself off the sand and try some of Ao Nang's many activities. Several dive shops are located in town that offer dive courses and dive trips. You can visit some fascinating underwater spots like the Nang Bay, Phi Phi Marine National Park, the King Cruiser wreck site and the Shark Point Marine sanctuary. For the adventure-seeker, you can even do some amazing cave diving at the islands of Ko Ha Yai. If you'd rather stay above the water, there are one day, speedboat tours available to explore the islands surrounding Ao Nang like Bamboo Island, Chicken Island, Tup Island, Poda Island, Hong Island, Lading Island, Pakbia Island, Rai Island and Daeng Island. They're all worth the day trip and there are discounted rates for groups. If you're really ready to get away from the water for a little bit, try rock climbing. Talk to your hotel staff or the Ao Nang travel agencies who will gladly arrange travel, lunch and all the rocks you can conquer. Then, of course, there are the staples of a tourist town including it boarding. Lessons and rentals are available through many tour agencies around town. Ask your hotel for more information. When looking for a place to eat in Ao Nang, keep an eye out for the "Clean food, Good taste" sign. This means that the restaurant prepares all of their meals with boiled water and is therefore always good. If you're a traveler on the go, however, there are a few street carts scattered throughout the town. Tuk-tuks in Ao Nang are a relatively cheap and easy way to get around. They charge a flat rate for trips all over town, so it's at least predictable. If you'd like to have more independence in your travels around Ao Nang, look into renting a motorbike. This is a great way to wander and see the hidden gems of the town. There are a number of shops up and down the major strips that will rent reliable bikes for 24 hours. Partying in Chiang Mai or other parts of Thailand? Going to the Full Moon Party in Koh Phangan? Hitting the beach in Koh Samui?